Four Master’s students from the Royal College of Art and Imperial College, London, UK, have created a bioplastic from chitin combined with vinegar. This sustainable plastic can be manipulated to produce items of varying stiffness, flexibility, thickness, and translucence by adjusting the ratios of the base ingredients. Apparently, the material can also be turned back into the original bioplastic solution. Shellworks is Ed Jones, Insiya Jafferjee, Amir Afshar, and Andrew Edwards. Their work is still at prototype stage, but it sounds like there is a potential for increasingly (if not utterly and entirely) recyclable, non-toxic plastic here. Sounds awesome! Visit the Shellworks website or Instagram for more. Images: Variety of Material Properties by Shellworks on Instagram. Bags and bubblewrap by Shellworks on Instagram. If I saw this on a screen, I wouldn’t believe it. I’d just put it in the “stupid, unrealistic, flashy tv / movie / game design” bin. Found via Cassandra Khaw on Twitter. Images: Skull seen from the side via Cassandra Khaw on Twitter. Drawing of skull by Benjamin Waterhouse Hawkins via Wikipedia. The Persian king Cambyses has a bad reputation. He has come down in Western histories as a prototypical mad emperor: arrogant, violent, and contemptuous. The centerpiece of this narrative is his treatment of the Egyptian Apis bull, but the evidence does not match up with the stories that have come down to us. Cambyses ruled the Persian Empire from 530 to 522 BCE. Under his rule, Persia expanded westward to conquer Egypt. Egypt was a valuable prize for Persia, phenomenally rich and well organized, with strong trade connections to the larger Mediterranean and Africa. The Persian conquest of Egypt went swiftly and easily. Holding the territory was another matter. The Persian Empire was the largest empire in the world, indeed the largest empire that had ever existed up that that point in world history. Persia owed a large part of its success to a policy of cultural accommodation. Conquered peoples were left alone to follow their own cultures, speak their own languages, and worship their own gods; Persian culture was not imposed on them. Persian kings took steps to ensure continuity of local traditions and present themselves according to local ideals and expectations. Cambyses followed this same policy in Egypt. He officially ruled as pharaoh under the Egyptian name Mesutire and he carried on the traditional religious and military activities of Egyptian kingship. Among those activities was providing for the Apis bull. Egyptians believed that an aspect of the god Ptah came to Earth in the shape of a black bull, known as Apis. Apis was cared for in a special temple and lived a life of luxury. When one Apis bull died, it was believed that the spirit of Ptah was born again in another calf, somewhere in Egypt. The death of an Apis bull was therefore an occasion of important ritual: the old bull became identified with the spirit of the god Osiris and had to be mummified and ceremonially interred, meanwhile the hunt was on up and down the Nile for the next calf to be born with the proper signs. Since the new Apis bull could not be born until after the previous one’s death, properly recording and commemorating the event was crucial. The finding of the new Apis was also the occasion for a major religious festival, which was joyously celebrated throughout Egypt. Horus, Uniter of the Two Lands, King of Upper and Lower Egypt, Mesutire, Son of Re, Cambyses—may he live forever! He has made a fine monument for his father Apis-Osiris with a great granite sarcophagus, dedicated by the King of Upper and Lower Egypt, Mesutire, Son of Re, Cambyses—may he live forever, in perpetuity and prosperity, full of health and joy, as King of Upper and Lower Egypt eternally! The cult of the Apis bull was closely connected to kingship in Egypt and this inscription shows Cambyses fully engaged in his role as Egyptian pharaoh. He associates himself with the royal falcon god Horus and shows filial deference to both the sun god Re and to the spirit of the dead Apis bull. Whatever Cambyses may have personally believed, he was making sure that his public behavior was irreproachable as a king of Egypt. When Cambyses returned to Memphis [after an unsuccessful military campaign in the south], Apis (whom the Greeks call Epaphus) appeared in Egypt. When Apis appears, the Egyptians at once don their best clothes and hold a celebration. Seeing this, Cambyses was convinced that they were celebrating his misfortunes, so he summoned the rulers of Memphis. When they came before him he demanded to know why the Egyptians were behaving in this way, which they had not done before, just when he was returning having lost so much of his army. They answered that a god had appeared, one who only came to them after long stretches of time, and that it was the custom for all Egyptians to rejoice on such an occasion. Cambyses replied that they were lying and he put them to death for it. He next summoned the priests, who told him the same thing. He replied that if a tame god had come to Egypt, he would know about it. He then ordered the priests to bring Apis before him, so they fetched him. Apis, or Epaphus, is a calf born of a cow which then cannot become pregnant again. 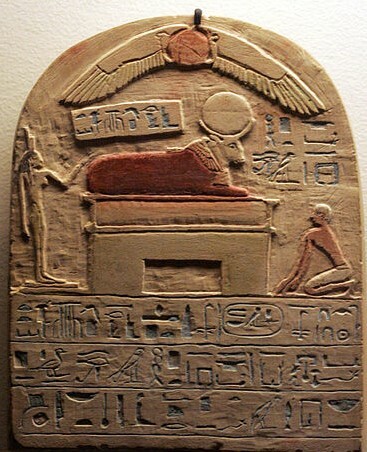 The Egyptians say that a ray of light from heaven strikes the cow, and this is how Apis is conceived. The calf called Apis has these signs: he is black with a white triangular mark between his eyes and the shape of an eagle on his back, the hairs of his tail are double, and there is a beetle-shaped mark under his tongue. When the priests led Apis in, Cambyses—who was a little disturbed in the head—drew his dagger and stabbed Apis, aiming for the belly but hitting the thigh. Laughing, he said to the priests: “Are these your gods, fools, of flesh and blood who can feel the bite of iron? This is a fitting god for Egyptians, but I will teach you to make a laughingstock of me!” Saying this, he ordered the priests whipped and any other Egyptians celebrating to be killed. So the festival ended and the priests were punished. Apis lay in the temple wasting away from the blow to his thigh. When he had died of the wound, the priests buried him in secret without Cambyses’ knowledge. How did Cambyses go from a king properly honoring Apis to a tyrant mocking and killing him? The answer is: Egyptian resistance. No matter how much Cambyses tried to behave like a traditional Egyptian pharaoh, he wasn’t one. Egypt had a strong sense of national culture, with a strain of isolationism. There were also internal conflicts within Egypt that the Persians did not manage with much success. Over time, as resentment against Persian rule built up, the memory of Cambyses the conqueror was adapted to suit Egyptians’ attitudes towards contemporary Persians. By the time Herodotus was traveling in Egypt asking questions about history—about a century after Cambyses—popular opinion had thoroughly rewritten the king’s reputation. Herodotus and other Greek and Roman historians had no idea about Cambyses’ actual behavior in Egypt, and their own anti-Persian prejudices inclined them to accept any negative story about a Persian king. Thus Cambyses the arrogant bull-stabber became a fixture of Western history, even though he was only ever a figment of lurid anti-Persian rumor. A few more possibilities for speculative writers and artists looking to break out of the Eurocentric worldbuilding mold, this time from among the Earth’s birds, snails, and mushrooms. The male pink robin (Petroica rodinogaster) has a bright fuchsia chest and belly; the female looks drabber, with merely pinkish-tinged underparts. These small birds live in the cool temperate forests of southeastern Australia. The many-colored fruit doves (Ptilinopus perousii) live on islands in the south-west Pacific Ocean (Fiji, the Samoan Islands, and Tonga). The male is yellow on the wings and back, red on the head and neck; the female is greener, darker on the back and greyer on the head and breast. The violet snail (Janthina janthina) is a small purple mollusk found floating on the surface in tropical and temperate seas worldwide. Indigo milk cap (Lactarius indigo) is a species of generally blue or blueish mushrooms found in eastern North America, East Asia, and Central America. The milk that oozes out of a cut or broken mushroom is also indigo blue, but slowly turns green upon exposure to air. 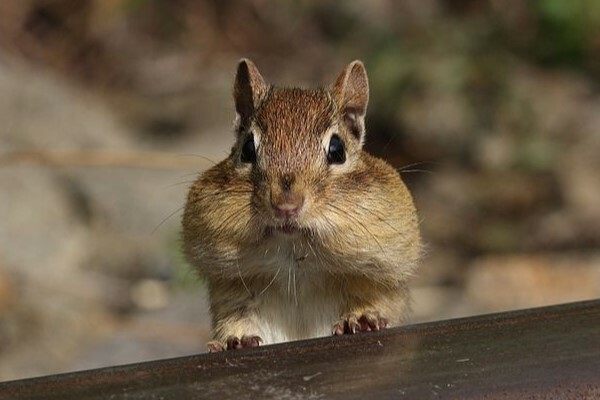 According to Wikipedia, it’s edible and sold in rural markets in China, Guatemala, and Mexico. Images: Pink robin by Dave Curtis on Flickr (CC BY-NC-ND 2.0). Many-colored fruit dove by Tom Tarrant on Flickr (CC BY-NC-SA 2.0). Violet snail cropped from photo by Ian Jacobs on Flickr (CC BY-NC 2.0). Indigo milk cap by Arthur T. LaBar on Flickr (CC BY-NC 2.0) and by Dan Molter via Wikipedia. “[…] we’ve put together a short recipe list — consisting of hors-d’oeuvre, entrées, and entremets based on traditional puffin and poultry dishes — for your perusal. As a source for his wild claim, Husband offers all of one link, and that goes to a CNN Travel article “Iceland food can be unusual; check out these 10 dishes”. Yeah… nope. Nopety-nope-nope-nope. So much NOPE! While Iceland is unquestionably one of the Nordic countries, it’s ludicrous to claim that the existence of a practice in one country (or even two) equals its existence in all five. Now, had Husband talked for instance of reindeer, he would be more correct, but still not entirely so. The Sami herd reindeer in the north of Finland, Sweden, and Norway, so we three nations tend to eat reindeer meat. In fact, sauteed reindeer or poronkäristys was one of the regular dishes at my elementary school cafeteria in Northern Finland, so I personally couldn’t call it a delicacy even though I’ve eaten it less often since. In Denmark and in Iceland it’s an import, and apparently they hardly eat reindeer at all (or so the all-knowing Internet tells me). But puffin? I’ve never even heard of eating puffin before, although it sounds like the practice does have long roots in Iceland and Norway (judging e.g. by the existence of lundehunder or puffin dogs in the latter) and some other areas like the Faroes. And now that I know Atlantic puffins are considered vulnerable, I wouldn’t eat them even if I happened to be in a country where hunting them wasn’t banned. Not even if you paid me. “Porg Recipes” arcticle found via File 770. Found via The Real Iran on Tumblr. My Tumblr source doesn’t unfortunately give any more info, but it sounds like the cup was found in the Bronze Age site of Shahr-e Sūkhté (or Shahr-e Sukhteh) in Sistan, southeastern Iran. Finding real-world inspiration like this is when I really wish I was a writer! Images: Animation via Wikimedia. Reproduction via Wikimedia. Cup photo via Wikimedia (Shahr-e Sūkhté, Iran; late half of 3rd millennium BCE; clay). 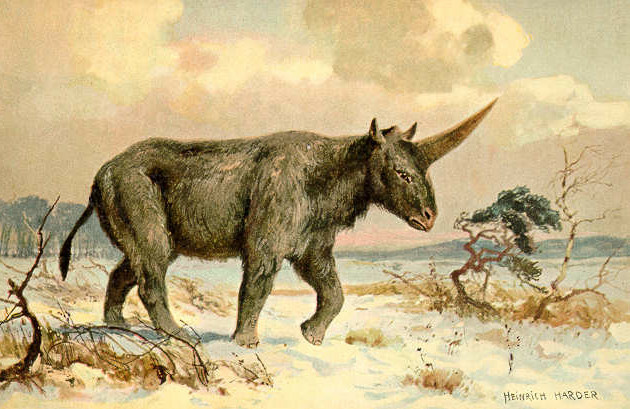 Besides being an awesome name for a band, paleolithic Siberian unicorn is an apt description of an animal otherwise known as Elasmotherium. Elasmotherium was a prehistoric relative of the rhinoceros that ranged across central Asia and eastern Europe. It stood over 2 meters tall at the shoulder and its body was as long as 4.5 meters. Its distinguishing feature was an enormous horn on its face. The exact size and shape of the horn have never been determined, since no horn remains have been found, but the bony basis for the horn can be clearly seen on preserved skulls. Elasmotherium was long thought to have gone extinct over 350,000 years ago, but recent work on a skull found in Kazakhstan has shown that the animal survived until at least 29,000 years ago. That puts living Elasmotheria in the middle of the upper (more recent) paleolithic (40,000-10,000 years ago). Humans certainly lived alongside them and may have depicted them in cave art. Some have speculated that Elasmotheria survived even longer and may have been the inspiration for fantastical animals including unicorns, as described by eastern European legends, and the Chinese qilin. It’s impossible to verify such ideas, but they’re fun to think about. From the city of Rome to the Arctic circle is a distance of about 2,750 km. At its greatest extent, the northernmost tip of the Roman empire was more than 1,000 km from the Arctic. Even across such a distance, however, there were connections. A couple of little pieces of evidence show us how knowledge of Rome could reach the far north, and how knowledge of the far north could reach Rome. 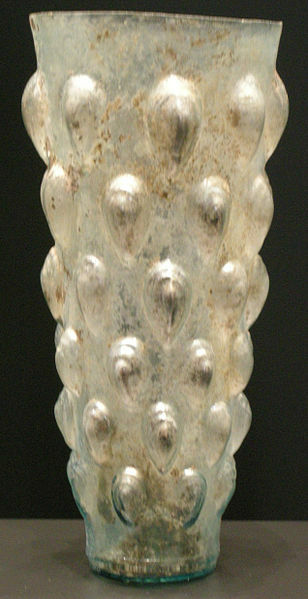 It is very unlikely that Føre had any direct connection to the Roman world. Rather it was at the northern extreme of a network of trade and alliances that spanned Scandinavia and the Baltic Sea region which used Roman imports as high-status trade goods and diplomatic gifts. The people of Føre may have had very little idea of what the Roman empire was, but they had some access to Roman goods and valued them as precious objects.